A few weeks ago, in the midst of watching Danny Granger exact some strange semblance of revenge on the Knicks during the Pacers come-from-behind 112-104 win in Indiana, I found myself awash in what today seems like a very logical wave of déjà vu. Minutes before he’d be ejected for hip-checking Leandro Barbosa in the game’s final 10 seconds, J.R. Smith showed himself to me. Or at least he showed me what I should have seen all along. With just under eight minutes left in that fourth quarter, I watched Smith and Melo battle each other for a defensive rebound. That was followed by a Knicks turnover, which was followed by Smith seeming so fed up with the proceedings that on his very next touch, he spun away from the basket and forced up the kind of whimsical turnaround jumper that inspires high school coaches to assign extra suicides. The shot was cash though, and Knicks coach Mike Woodson surely swallowed another gulp of the sort of angst that collects like phlegm when dealing with a team like the Knicks. Really, the shot was commonplace, the kind of ill-advised, battering-ram antics that play out daily on every court in the country, but the feeling of muted disgust it brought was way too familiar. Knicks fans have dealt with J.R. Smith before, but back in the ‘90s, he was called John Starks. To be fair, the comparison is far from qualitative. Starks was an All-Star and an anchor of one of the most competitive Knicks teams ever, but as these Knicks try their damnedest to hold onto that 8-seed and, further yet, avoid a first-round playoff exit, fans can look to Smith, not so much for leadership or late-game heroics, but for humanity and identity. If J.R. Smith is anything, he’s an imperfect player, much in the way New York is an imperfect place. He’s got all the tools but can never quite sync his ability with his ambition. As a player, he’s is streaky, athletic, deeply invested, and admirably overconfident. His play is consistently inconsistent, and he carries a fire in his stomach of a questionable origin. Knicks fans watch Smith in hopes that the next game is the game he blows up for multiple 3s in the second half or one in which he is so incensed by his defensive assignment that he begins badgering them at half court. Either is possible, the way they were when people hoped the same exact things about Starks. Back in Denver, Smith played an early Westbrook to Melo’s Durant, barely yielding to his superstar teammate, endlessly dissatisfied with his role in the offense. The Knicks have managed to avoid this. New York, in fact, has everything J.R. Smith needs. There is fashion (of which he Twitpics his own ideas regularly), the parties (of which his Twitpic-ing has surely just begun), and rapper ex-girlfriends (of whom he probably shouldn’t Twitpic anymore). But he belongs here. He’s young and tatted to the gills, the aesthetic this city deserves, regardless of whether the front office refuses to put him on a promo poster. This Tuesday against the Celtics, Smith turned in a performance most sensibly classified as very rare. He checked in at the 4:20 mark of the first quarter, bricked a long jumper on his first touch, and then waited for a swing pass behind the 3-point line. (The Knicks would go on to turn the ball over.) But then there was deft ball control and a sanctified shooting touch. He hit 3s like he was playing around the world with his niece. He threw no-look passes. He carved up Brandon Bass. The second half brought more of the same. He buried a 35-footer in Rondo’s mouth as the shot clock expired. He forced turnovers and, at one point, dived for a loose ball. 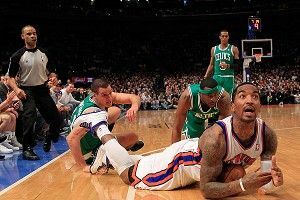 This is not the J.R. Smith whom Knicks fans should expect to see every night. But it is the one we can wait for. Felipe Delerme is a Brooklyn-based freelance writer and editor whose work has appeared in The FADER, Complex, SPIN, and Pitchfork. Follow him on Twitter at @Felipe2egundo.